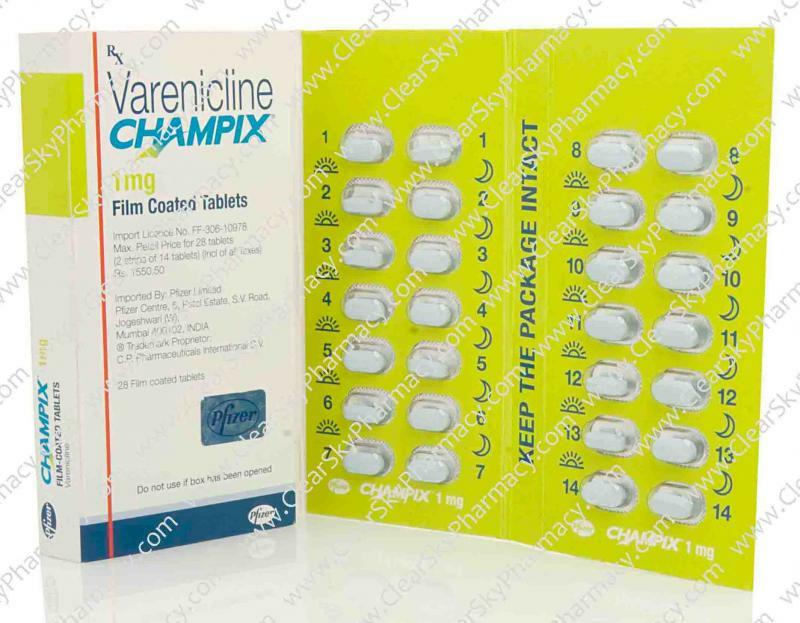 Champix Tablets (Varenicline Tartrate) is use to help adult smokers to stop smoking. Varenicline helps to reduce craving and withdrawal symptoms that can happen while you stop smoking. Quitting smoking can lower your chances of having lung disease, heart disease or getting certain types of cancer that are related to smoking. Chantix tablets / Champix (Varenicline) is not recommended for persons under 18 years of age. Champix tablets are available in strengths of 0.5 mg and 1 mg. Note that Chantix is the USA brand and Champix is the brand in Europe and other countries. Champix . Champix is also known as Chantix, also manufactured by Pfizer. 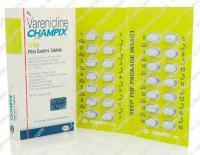 The active pharmaceutical ingredient in Champix (Chantix Tablets) is Varenicline Tartrate. A complete course takes 12 weeks and may be continued by another 12 weeks to help ensure your attempt to stop smoking is successful. Chantix/ Champix (Varenicline) comes in strengths of 0.5 mg and 1 mg. You start with the lower 0.5mg dosage and then increase to the 1 mg dosage. Take this medicine after eating and with a full glass (8 ounces) of water. The "starter package" of 11 x Varenciline 0.5 mg tablets and 14 x Varenciline 1 mg tablets is available to assist with the initial dose schedule required when commencing Varenciline. For continuing treatment, Varenciline 1 mg tablets are available in packages of 28 tablets each. You are more likely to stop smoking if you are motivated to stop. Your doctor can provide advice, support and sources of further information to help ensure your attempt to stop smoking is successful. Before starting your course of Varenciline you should decide on a date in the second week of treatment (between day 8 and day 14) when you will stop smoking. You should write this date on the pack as a reminder. You will need to keep taking the full 12-week course of Varenciline tablets even though you stop smoking in the second week. Your doctor may recommend that you take a second course of treatment with Varenicline 1 mg. This is usually for another 12 weeks . This may be the case where you have stopped smoking but your doctor feels that you would benefit by another course of Varenciline to help you stay cigarette-free. Day 1 - 3: From Day 1 to 3, you should take one white Varenciline 0.5 mg tablet once a day. Day 4 - 7: From day 4 to day 7, you should take one white Varenciline 0.5 mg tablet twice a day, once in the morning and once in the evening. Day 8 - 14: From day 8 to day 14, you should take one light blue Varenciline 1 mg tablet twice a day, once in the morning and once in the evening. Day 15 - end of treatment: From day 15 until the end of treatment, you should take one light blue Varenciline 1 mg tablet twice a day, once in the morning and once in the evening, After 12 weeks of treatment, if you have stopped smoking, your doctor may recommend another 12 weeks of treatment with Varenciline. This will increase your chances of stopping smoking long term. For this course take one light blue Varenciline 1 mg tablet twice a day. This dosing schedule may not be right for everyone. Talk to your doctor. Your doctor may want to reduce your dose if you are having side effects such as nausea, strange dreams, or sleep problems. If you miss a dose of this medicine, take it as soon as you remember. If it is close to the time for your next dose, wait. Just take your next dose at your regular dose. Some people have had changes in behavior, hostility, agitation, depressed mood, and suicidal thoughts or actions while using this medicine to help them quit smoking. When you try to quit smoking, with or without this medicine, you may have symptoms that may be due to nicotine withdrawal, including urge to smoke, depressed mood, trouble sleeping, irritability, frustration, anger, feeling anxious, difficulty concentrating, restlessness, decreased heart rate, and increased appetite or weight gain. Tell your doctor about side effects that bother you or that do not go away. Ask your doctor for more information. You should not use Chantix/ Champix (Varenicline) while using other medicines to quit smoking. Tell your doctor if you use other treatments to quit smoking. Know the medicines you take. Keep a list of them with you to show your doctor and when you get a new medicine. Use caution driving or operating machinery until you know how this medicine may affect you. Some people who use Chantix/ Champix (Varenicline) may feel sleepy, dizzy, or have trouble concentrating, that can make it hard to drive or perform other activities safely. FDA pregnancy category D. This medicine can cause harm to an unborn baby. This medicine may cause injury and even death to the unborn baby if you take it during the second and third trimesters of pregnancy. Do not use this medicine without your doctor's consent if you are pregnant. Use an effective form of birth control. Stop using this medication and tell your doctor right away if you become pregnant during treatment. It is not known whether this medicine passes into breast milk or if it could harm a nursing baby. Do not use Chantix/ Champix (Varenicline) without telling your doctor if you are breast-feeding a baby. You can buy Champix (Chantix pills) online from Clear Sky Pharmacy. Champix tablets, manufactured by Pfizer are supplied in a box of 25 or 28 tablets. Chantix tablets of 1 mg strength cost only $1.96 per unit when you place an order for 168 tablets. Champix tablets (Chantix pills) are also available as a starter pack.